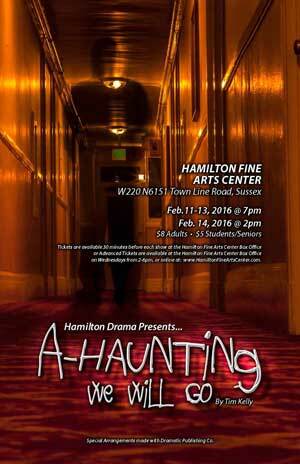 Hamilton drama to present “A-Haunting We Will Go” - Hamilton School District. Hamilton High School Drama Department presents “A-Haunting We Will Go” Feb. 11-14 in the Hamilton Fine Arts Center (HFAC). Shows begin at 7 p.m. Thursday through Saturday, and at 2 p.m. for the Sunday performance. It is a family-friendly performance suitable for children over the age of nine. “A-Haunting We Will Go” is the story of Norma Corwin who made a childhood vow that once in her life she would spend a night alone in The Inn of the Three Sisters, an eerie and forbidding hotel famous for an unsolved murder, horrifying spirit manifestations and murderous intrigue. When she learns the inn is to be dynamited to make way for a new highway, she decides the time is now or never and the fun begins. General seating tickets are $8 for adults, $5 for students and senior citizens. Tickets may be purchased 30 minutes before the show at the HFAC Box Office, at the Box Office on Wednesdays from 2 to 6 p.m. or online at www.HamiltonFineArtsCenter.com.